Before you start building your home solar power system, you need to know how much power is needed for your home utilization. This will determine how big your residential solar system will be and at the same time, gives you a rough estimated project budget. To calculate your energy needs, follow the 3 steps below. 1) Calculate your home daily energy usage. To get this figure, you begin by getting your home energy bills for the last 12 months and calculate the average kilowatt hour (kWh) usage per month. Why do you need last 12 months bill? Reason being, the power usage of your home fluctuates throughout the seasons. Add up the total power used for the past 12 months and divide it by 12. That will give you the average monthly power consumption. Now, take the figure and divide it by 30 and you should have your average daily power consumption. 2) Solar power system output. This is to determine how much power you need the solar system to generate. But before you begin, find out how many usable sunlight hours your region receive per day. Different areas will have different average sun coverage. To get this number, look at the solar insolation map. Now, use the average daily power usage you calculate earlier and divide it by the number of daily usable sunlight hour from the insolation map. Next, multiple the number with 1.25 as a factor to account for energy wastage from wiring, batteries, charge controller, power inverter etc. Here’s an example, assuming your daily power needs is 15.4 kWh and your region has average 5.5 hours of sunlight. Then the calculation will be 15.4 / 5.5 x 1.25 = 3.5 kWh or 3500 watts a day. Assuming you are getting a solar panel rated at 180watts, then you will need 3500/180 = 19.4 or 20 pieces of solar panel. 3) Photovoltaic (PV) panel watt cost. Now, you need to calculate how much it will cost you to buy all the PV panels needed to generate at least 3500 watts of power. For the time being, the highest average cost for solar panels in the United States is $4.98 a watt. So, the solar panels cost will be 3500 x 4.98 = $17,430. The figure is a rough indication of how much it will cost you to buy the solar panels. Remember, the budget excludes the cost of wiring, charge controller, battery bank, power inverters etc. The number above looks quite high and most home owners will shy away from using solar energy to supplement their energy needs. Don’t worry, the government is willing to give you a helping hand. In my next post, I’ll share with you how government rebates and credits will help you to reduce your home solar power project cost. 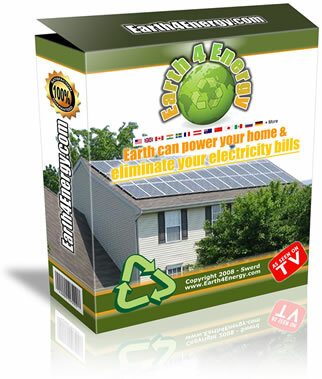 Do you want to know how to get started on building your own DIY home solar power system? If you do, check out Micheal Harvey’s Earth4Energy guide book. The manual comes with pdf files and step by step High Definition (HD) instructional videos. Click on the link below for more information. Solar Energy is clean, breathtakingly abundant, and is a reasonable recourse to meet much of the world’s energy needs. Harnessing the same sunlight that has kept the earth warm for eons, we can finally achieve a more sustainable balance with nature as humanity advances and finds new, cleaner, and more efficient means of meeting its energy needs. The PowerMeter application by Google is a new software that allows all users to check for home energy information that will help keep their home being more eco-friendly. This is not just an app that lets your home become more eco-friendly, it’s an app that lets you check out the information concerning your home’s energy. For any necessary reason, Google’s PowerMeter is not only a welcome addition to any iPhone or iPad, it’s also a unique way to bring new users to their online applications. As technology has evolved in recent years, many people have been introduced to new ideas that would innovate their own thinking. This is a new app that will be features on your web-enabled phone, iPhone, and iPad. Google’s PowerMeter is an app that transmits and measures data in real time so that you can monitor your power usage in an instant. With this application, you can take real time data from your power monitor and show you the total power usage in your home. It’s useful to measure your month home electricity usage.